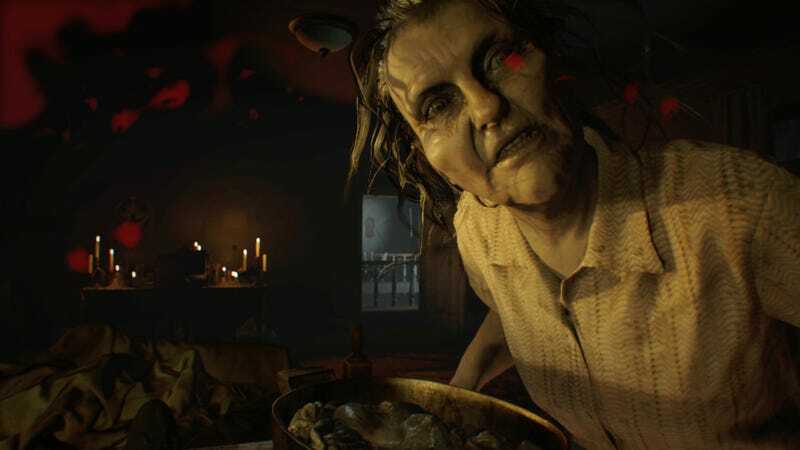 Resident Evil 7 was a pleasant surprise that left me eager for more. Today, the first round of DLC was released on Playstation 4. Banned Footage Vol. 1 adds a few new challenges including one of the best puzzles in the entire series. It’s fair to say that I was skeptical of Resident Evil 7's DLC plans. The game has been out for one week and there’s already downloadable content. Not free downloadable content either. This stuff costs $9.99. Slicing up a game and charging for bits and pieces so soon and for so much is a bummer. Thankfully the DLC is still pretty good. Banned Footage Vol. 1 has three parts. Nightmare is a survival mode where players need to survive until the morning inside the Baker’s guest house. You’ll run around avoiding enemies and crafting weapons in a frantic fight to last until the sun rises. Ethan Must Die is a difficult mode with randomized items and difficult enemies that tasks the player with defeating a specific target. It provides provide plenty of challenge and punishment for eager players but mostly just made me miss the excitement of the previous games’ Mercenaries modes. The last part of the DLC provides an intense and satisfying puzzle experience that ranks as one of the best in the series. In Bedroom, you play as Clancy, the cameraman of the ill fated Sewer Gators crew from the demo. Locked in, you guessed it, a bedroom, you must figure out how to escape. To add to the tension, too much noise will bring in Marguerite Baker. You’ll have a limited time to clean up the room and hide evidence of your puzzling before she returns to check on you. Leave a drawer open or put a painting in the wrong spot and you’re in big trouble. It would honestly be enough to craft a smart room escape puzzle. Bedroom already does that; there’s locks to open, journal entries to read, items to combine, and secrets to be found. It’s even better than the main game’s ‘Happy Birthday’ sequence, which was one of its best moments. The need to hide your progress in Bedroom adds additional stakes that elevate an already well designed set piece. I really wish that Bedroom had been part of the main game. It’s a great puzzle that highlights just how smart Resident Evil 7 can be. Banned Footage Vol. 1 offers a lot of cool stuff and will definitely scratch the itch of anyone who wanted more challenge from the original game.